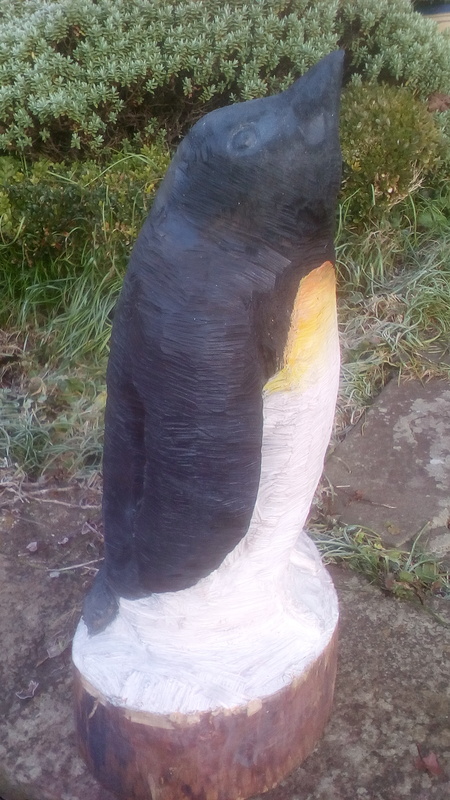 Just finished up carving this little guy; it looks a lot better in the real world than it does in the photos, makes me smile when I walk past it. All done with the saw, except for the eyes. Bit disappointed with the feet but I'm fairly happy with the rest. Wife wants me to carve a few more 'just like that' ready for Christmas.....Any comments welcome, positive or negative, that can improve my technique? Oh and credit where credit is due; I did lots of research for this project but the penguin carving posted by Woodwizard was a major influence on the pose I decided on for my carving. Just the right weather for it. That'll be a popular carving at this time of year.